The News: Alliance Memory has greatly reduced lead times for its DRAMs with -40°C to +105°C automotive temperature ratings. The company offers a complete lineup of automotive temperature CMOS SDRAMs, including double data rate (DDR), DDR2, and DDR3 devices. A full list of Alliance Memory’s automotive solutions is available here. 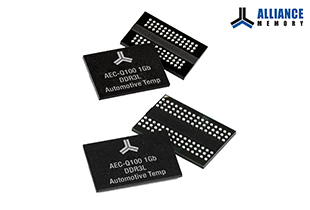 The Context: Alliance Memory’s lineup of automotive temperature CMOS SDRAMs includes DDR, DDR2, and DDR3 devices in a wide range of densities and package options. To provide designers with a quick reference guide, a complete list of the company’s automotive memory solutions — complete with key specifications and links to datasheets — is available here. In response to customer demand, Alliance Memory now also holds many of its automotive temperature range DRAMs in finished goods stock, and in addition can promise lead times of just six weeks for its most popular automotive memory solutions. Availability: Samples and production quantities of the automotive DRAMs are available now, with lead times from stock to six weeks.